Please accept my blessings. Regarding your question about the inhabitants of Brajabhumi or Vrindaban it is to be understood that Vrindaban is the original abode of Lord Krishna as He is the original Personality of Godhead. In that transcendental plane He has His transcendental associates in different exchange of humour. For ourselves when we are in perfect stage of devotional service, we can know our eternal relation with Krishna and as such one of the associates of Lord Krishna becomes our ideal leader. This acceptance of leadership by one of the eternal associates of the Lord is not artificial. Do not therefore try it at present it will be automatically revealed to you in proper time. Regarding the house, you are already in trouble. The best thing is to stop this strain. Mr. Lerner told me that Mr. Hill has no sufficient money to purchase the house. I definitely instructed you if Mr. Hill enters into agreement with Mr. Taylor it is then only you could hand over the check of $5000.00 to Mr. Hill or his agent. But you have not followed my instruction and now you are in trouble. If Mr. Hill has no money to purchase the house then his accepting our check is clear case of cheating. So immediately inquire if Mr. Hill has at all money to purchase cash from Mr. Taylor. If not immediately demand back the check otherwise consult our good lawyers and file a cheating case. We cannot forego this cheating conspiracy, if Mr. Hill has no money. He must either deliver the possession of the house immediately or must return the money immediately or file cheating case against all the combined group namely Mr. Payne, Mr. Hill and Mr. Palmer. I do not know what is actual case but from the telephonic conversation of Brahmananda it appears to be an organized cheating case and you have to face with courage without excusing any one of them. We are not revengeful but we cannot lose Krishna's money for nothing. 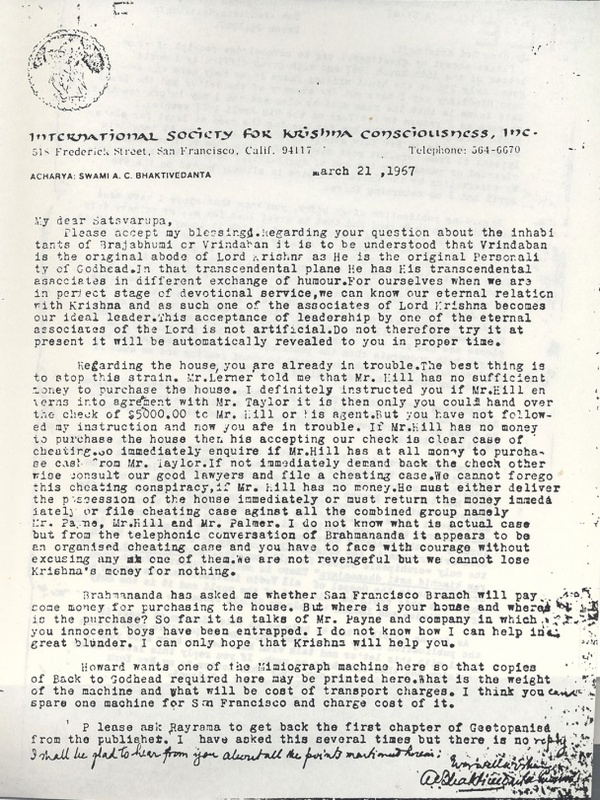 Brahmananda has asked me whether San Francisco Branch will pay some money for purchasing the house. But where is your house and where is the purchase? So far it is talks of Mr. Payne and company in which you innocent boys have been entrapped. I do not know how I can help in great blunder. I can only hope that Krishna will help you. Howard wants one of the Mimeograph machine here so that copies of Back to Godhead required here may be printed here. What is the weight of the machine and what will be cost of transport charges. I think you can spare one machine for San Francisco and charge cost of it. Please ask Rayarama to get back the first chapter of Geetopanisad from the publisher. I have asked this several times but there is no reply. [handwritten] I shall be glad to hear from you about all the points mentioned therein. This page was last modified on 10 February 2019, at 16:23.